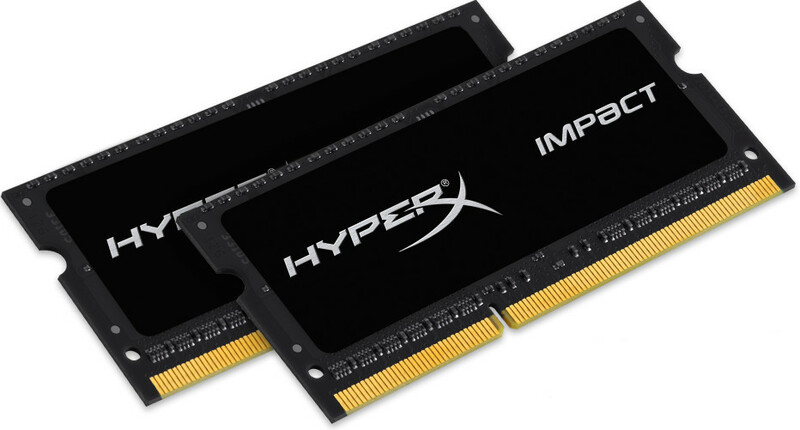 The HyperX division of Kingston, which designs and manufactures computer memory, has announced the existence of new 16 GB memory modules that belong to the company’s Impact line of DDR4 memory. Up until now the Impact memory line had memory modules with capacities of up to 8 GB. The addition of the new 16 GB memory modules means that the Impact line will also be available as kits with capacities of up to 64 GB. The thing is that the new Impact memory comes in the SO-DIMM form factor, which means it can be used predominantly in notebooks. The new memory runs at 2133 MHz and at 2400 MHz and offers different latencies. A single 16 GB Impact DDR4-2133 memory module comes with CAS latency of 13 clocks, while a 64 GB kit at 2133 MHz runs at CL14. The 16 GB Impact DDR4-2400 module works at CL14, while a 32 GB memory kit, which consists of the same memory operates at CL15. The new memory works at 1.2V and is fully optimized for Intel 100-Series chipsets. It also supports Intel XMP profiles, which means the memory can be easily overclocked. The Impact SO-DIMMs operate safely at 0°-85° degrees Celsius so additional cooling will likely be not needed. The new 16 GB Impact memory can now be ordered online with availability in stores expected soon. As to pricing the memory sells for USD 109 – USD 445, depending on the kit and speed.